June 25th, 2011 marked the second anniversary of the death of Michael Jackson. I find it very interesting how iconic celebrities like Jackson are commemorated. The town of Gary, Indiana, Jackson's boyhood home, has promised a yearly tribute to the King of Pop. This outdoor event includes music, vendors and ends in a candlelight vigil at dusk. It's held at the old Jackson family home. 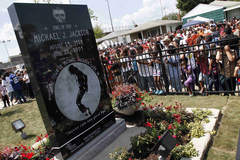 On the first anniversary of his death the city unveiled a monument to Jackson. 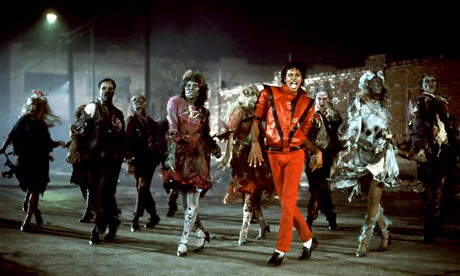 Jackson's "Thriller" jacket (the red jacket worn in his Thriller video, seen above) was auctioned off for $1.8 million this year on the June 25th. Apparently a portion of the proceeds will go to the Shambala Preserve, home to Jackson's two Bengal tigers, Thriller and Sabu. But my absolute favorite way that Jackson was commemorated was various dancing flash mobs. (Flash mobs have made the news a lot lately as there are apparently stealing flash mobs where a group mobs a store and just walks out with merchandise.) These are large groups of people getting together and suddenly breaking into dance. Since his death, these have occurred all over the world from China to Mexico. The video below was taken in Stockholm, Sweden in the weeks after Jackson's death. I found it impressive. The video below was in San Francisco, this year.